Forboding Angel's vision of a flexible, story-driven universe drawing heavily from classic game design and modern artistic sensibilities. My room-mate found Evolution RTS on Steam. Knowing I do not like running proprietary software, they suggested I try this because it is released under a liberal license, does not require steam, and (was) flagged as being Linux compatible. The download page has very terse instructions. It is not explained why I am downloading something called weblobby-1.4-linux32.zip, rather than Evolution-RTS. The launcher did not work, failing with: "Illegal instruction"
remote: Reusing existing pack: 19992, done. remote: Counting objects: 19, done. remote: Compressing objects: 100% (18/18), done. Receiving objects: 100% (20011/20011), 802.90 MiB | 637.00 KiB/s, done. Resolving deltas: 100% (12109/12109), done. Checking out files: 100% (5416/5416), done. The problem was that there were no build instructions in the resulting directory. Then it dawned on me that it is not Evolution-RTS that I have to build, but the spring engine instead. Instead of building, I used the pre-compiled package for my distribution: spring 96.0+dfsg-2 i386 modern full-3D RTS game engine. Edit: I got a warning my version of Spring was a couple of revisions behind (0.194 vs 0.196); not sure how important that is. Debian has a long-standing policy of doing "bug fixes only" for the stable distribution (I am currently using the more up-to date testing distribution). Edit2: Spring is uptodate, springlobby 0.194-2 i386 single/multiplayer lobby for the Sp.. is a couple of versions behind. However, I could not find clear documentation on how to actually let spring launcher know I downloaded all of the files already. The Spring Readme page explains I need at least 1 game and map installed, but the game and map links, just link back to the terse download page. If would be helpful if the git repository had a readme.txt file explaining how to install the game files. I have also refused to agree to the Terms of Service for the IRC server as-written. This mean that I do not have permission to join the #evolution channel. I am not sure where to report the problem with the Terms of Service. Your post was quite the roller coaster ride. In response solely to the first difficulty you encountered, please report weblobby bugs to the github page. You said the launcher didn't work and I'm assuming you were referring to weblobby. The rest of the adventure may be avoided if we can get you over that first bump. Now I am even more confused: why would the average user be guided to use a "Web-based lobby client" by default? The "illegal instruction" error is expected if the Binary was compiled with CPU instuctions my CPU does not support (like SSE2/3 instructions). I am not sure it is a bug, unless it was explicity compiled with support for my CPU. It may be a documentation bug on the Evolution RTS download page (linked in my first post). I would prefer to use the precompilted pakages that come with my GNU/Linux distro if possible. Downloading and running random executables off the internet results in a broken and/or compromised system. What I want is instructions on how to let my local SpringRTS engine (or launcher) know where game data files are. I feel these instructions may have been deliberately omitted for fear of confusing the "average" user. As far as I know, to get single-player working I just need to put the game files in whatever magic sub-directory springlobby expects. However, I have not found clear documentation as to where game files are allowed to reside. Quite a few of the games listed above come with standalone installers, which makes things easy. Check their website to find out! In some cases however, the game will only distribute a game-file, for example BA750.sd7 or XTA.sdz. For these games, you have to install the stand-alone Spring-Engine first, and then place the game-file in the ...\My Documents\My Games\Spring\Games\ or ...\Spring\games\ folder (~/.spring/games/ on Linux/Unix/Mac). You may install multiple games in the same engine installation. To play a game, you also need a map. Maps are ".sd7" or ".sdz" files. To install this files move them into (Unix) ~/.spring/maps or (Windows) "My Documents\My Games\Spring\Maps". As is the case with games, use the "Reload maps/games" option from the "Tools" menu in SpringLobby. james@torchlight:~$ find /home/james/Evolution-RTS/ -name "*.sd7"
james@torchlight:~$ find /home/james/Evolution-RTS/ -name "*.sdz"
# This file makes Spring ignore .git directory when calculating checksum. # This should allow to play multiplayer directly using a clone of the repo. The above suggests that if I copy or symlink the directory into the right place, it will work. I have not been able to find documentation explaining what springlobby (or weblobby) expects. ScummVM (an unrelated meta-game engine) lets me browse the directory tree to find game files. PS: Forgot to mention: I can not automatically download game files from a server hosting a game because I am not allowed to see the "battle list" or "battle room" until the problem with the Terms of Service is resolved. The difficulty with those instructions is that I have many files, not just one. Put all games in the games dir & all maps in the maps dir, as the instructions you quoted above tell you to. Aslo, if I want to play more than one spring engine game: all of that data files would be mixed together if I followed the above advice. It would mean all games were in the same directory, as were all maps, yes, if that's what you mean by "mixed". That is what the instructions say and that is what you should do. Typically, each game will be a single .sdz file and each map will be a single .sdz or .sd7 file. What I want is instructions on how to let my local SpringRTS engine (or launcher) know where game data files are. I feel these instructions may have been deliberately omitted for fear of confusing the "average" user. The average user is not expected to do this, since after logging in to the lobby the files can be easily auto-downloaded into the correct places. If you are having trouble installing weblobby - and I can't help you with it - you could try springlobby, but don't forget to report your weblobby bugs where CarRepairer said above; weblobby is actively developed. If you really want to understand the details of Springs folder structure, the documentation (not aimed at newbies) is here http://springrts.com/phpbb/viewtopic.ph ... rs#p538808. Perhaps you alsop forgot to explain what this problem was? Since you've put everything else here, there is nothing wrong with doing it in this thread. You will have to agree to the same ToS regardless of what lobby client you use. phillipsjk wrote: PS: Forgot to mention: I can not automatically download game files from a server hosting a game because I am not allowed to see the "battle list" or "battle room" until the problem with the Terms of Service is resolved. If similiar happend to you then as workaround just register a new account. Or do you mean you do not want to agree to the TOS for some reason? Last edited by knorke on 17 Jul 2014, 13:10, edited 1 time in total. Just a quick note on the "terse" instructions... it is my experience that the average user assumes they know everything and stops reading around word seven and starts looking for something they can click on... knowing WHY you have to do something is trivia, all you need to know is that you need a lobby to launch a game using the Spring engine. Also "Weblobby" is available as a stand-alone application now, it is called Weblobby mostly because it was originally deployed as a web-based lobby. Yes, well we know that. But we can't expect new people to know all those details. SinbadEV wrote: Just a quick note on the "terse" instructions... it is my experience that the average user assumes they know everything and stops reading around word seven and starts looking for something they can click on... knowing WHY you have to do something is trivia, all you need to know is that you need a lobby to launch a game using the Spring engine. Its pronounced Webl' hobby - it was started by a guy called Webl and it was his hobby. Just to clear things up. PicassoCT wrote: Its pronounced Webl' hobby - it was started by a guy called Webl and it was his hobby. Just to clear things up. knorke wrote: Or do you mean you do not want to agree to the TOS for some reason? As written, the terms apear to be repeated ~5 times. I can only "agree" to them after checking that all copies are the same. It sounds like that may be faster than trying to figure out how to spit out achive files from the source directory. Would hate to download ~1GB of data again though. Edit: I would also like it be possible to play a single-player or LAN game without agreeing to the Terms. Last edited by phillipsjk on 17 Jul 2014, 18:28, edited 1 time in total. knorke wrote: As written, the terms apear to be repeated ~5 times. phillipsjk wrote: As written, the terms apear to be repeated ~5 times. 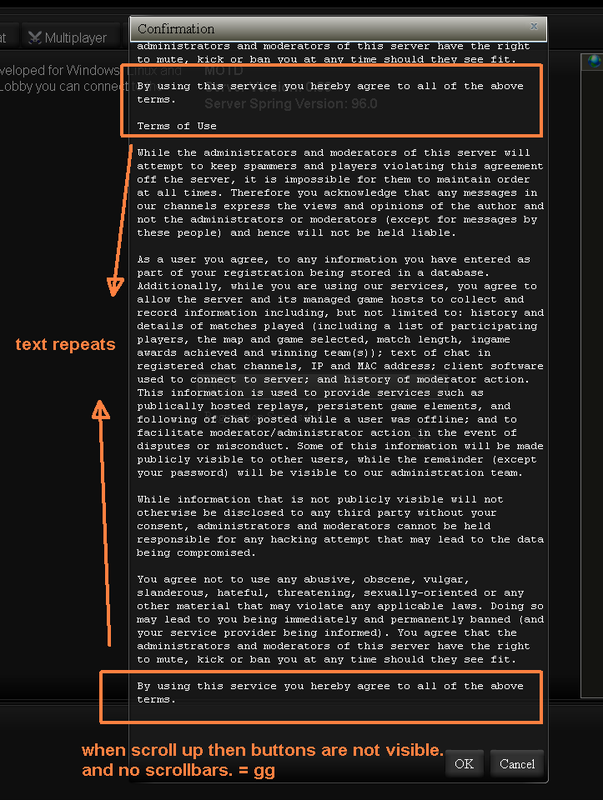 Think it is bit unclear what is happening: can you show a screenshot of the "repeating terms of serivces"? There should be only one terms of services and it only needs to be accepted once, after registration. phillipsjk wrote: Would hate to download ~1GB of data again though. If you create new lobby-account you do not lose anything you downloaded. Seems bit strange, how did you download "1 GB of data" anyway? If you did not yet manage to sucessfully to log into the lobby then the lobby can not have downloaded anything for you, yet. So did you maybe use the weblobby installer thing that comes via steam, where it pre-downloads some files without having to log in? The dialog contains the TOS text multiple times. If it the window happens to be scrolled up then buttons are not visible because they scroll with the text. There are no scrollbars so I could only scroll with mousewheel-click. Someone who does not figure that out can only close the TOS-text via the [x]-button and then is locked out.. I was unclear if this was caused by springlobby or lobby.springrts.com. Edit: it appears that knorke reproduced the problem with weblobby. The repeating text was present in the pastebin link up-thread (generated with springlobby AFAIK). phillipsjk wrote: The repeating text was present in the pastebin link up-thread (generated with springlobby AFAIK). Ooooh. Yes, that was with springlobby. I orginally just posted the TOS text on pastebin because I thought you disagreed with some part of it. Hm, what stops you from agreeing to TOS? "Legal" or "technical" problem? "Technial:" In springlobby the yes/no buttons are always visible, it is only in weblobby that the buttons can disappear. In windows it worked to click with mousewheel and then move mouse to scroll until buttons appear. I tried using (p)7zip and putting the resulting file in ~/.config/spring/games/Evolution-RTS.sd7. The * ingores the .git subdirectory that has an 800MB incompressible file. With the resulting file placed in ~/.config/spring/games, It is now listed by Springlobby as "Evolution RTS - $VERSION" -- so I am still not sure I did it right. knorke wrote: Ooooh. Yes, that was with springlobby. I orginally just posted the TOS text on pastebin because I thought you disagreed with some part of it. I have a bad habit of reading fine-print. However, increasingly, I find the people/organizations asking me to agree to such terms do not put a lot of thought into them. People are not expected to read them, which begs the question: why are they required? The problem is that I do not know what I am agreeing to until I formally verify that all of the repetitions are in fact the same. As for the "no need to read it so often" comment: typically a clause is included that the TOS can be updated at any time (including for this very forum). It is supposed to be the user's responsibilty to keep track of changes. Now, the TOS for the lobby does not appear to have such a clause, but I am not absolutely sure yet. Yes, agree with your view on TOS. In this case it is just some bug/accident that the text is repeated. Since this is just some random online game with free registration where no data is entered (not even email is required) my personal opinion is "Just click [yes]" Still totally understandably that others might want to actually read it. BUT: without agreeing to TOS and without loging into lobby it will be very hard/confusing to get all the nessecary files: Letting the lobby download the files is way easier. That is not because of some DRM or similiar but simply because there is not yet a good solution to pack all the files for offline gaming. Then it dawned on me that it is not Evolution-RTS that I have to build, but the spring engine instead. Downloading the game-files and then zipping them into a Evolution-RTS.sd7 is NOT needed and will NOT work. you would have to edit a file, replace the $VERSION with the correct version number and so on..just forget about that because it sidetracks too far into details of spring. Downloading those game files had basically no use, sorry. On some systems you maybe have to download the engine source to compile it but for game files it is useless. Instead the lobby will download the game-files. The lobby will also download maps and even new versions of the engine, when released. The validmaps.lua file is something else, but basically correct. That is a problem that Spring peoplepersons are still figuring out how to solve. Some games have in past offered complete installers, including some mappack, but currently no such complete installer with current engine version exists. So I would currently not possible to go that route. It is not listed as install-option on http://www.evolutionrts.info/download/ anyway. Spring is for the most part played online: So players just build their map-collection over time when the lobby downloads them. To get maps without going online in lobby you can look around on springfiles.com ,but that is already more tricky and average players do not do that.